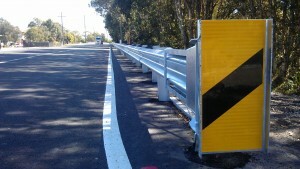 W Beam Guardrail is a malleable steel safety barrier designed for installation on roadsides, car parks and mine sites. This design system is installed using posts and blocks, which are either rammed into the ground or attached to base plates and finished with an appropriate end terminal (see types below). 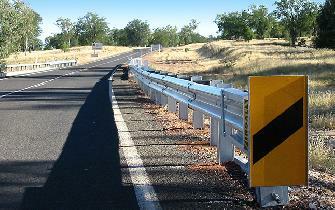 Several variants within the guardrail design allow for safe coverage of bridges, poles, steep embankments, sharp curves and other typical roadside hazards. 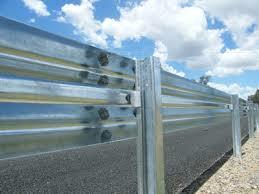 W beam guardrail is a superior choice for safety, strength, durability and affordability. 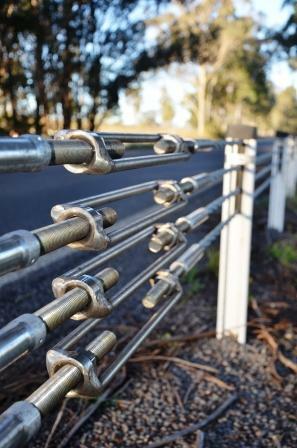 D&P Fencing Contractors’ complies with the Australian Standard AS/NZS 3845:1999 in road safety barrier systems and are specialist installers of this type of fencing. See also our Technical Standards page for links to relevant standards drawings within NSW. 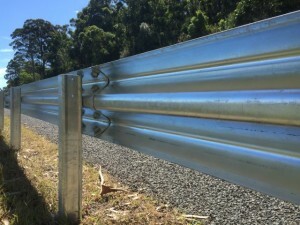 Manufactured by Ingal Civil Products, Ezy-Guard Smart guardrail crash barriers impose lower forces to the impacting vehicle than traditional guardrail crash barriers. 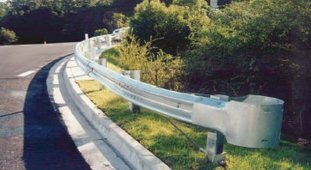 As the crash barrier deflects, vehicle impact energy is dissipated which as a result, reduces occupant risk. The lightweight, ductile Z-posts provide a forgiving impact, reducing ride-down deceleration forces and minimising vehicle damage. Hot dip galvanised in accordance with AS/NZS 4680. 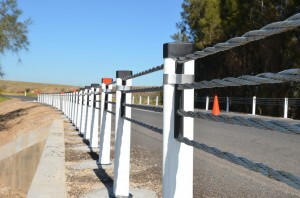 Wire Rope Safety Barriers (WRSB) use a unique woven wire rope system that is threaded through posts and tightly tensioned using a swaging machine. Either end is anchored to the ground using 32mpa concrete. This specialised design helps to control the deflection of vehicles upon impact and generally results in lower levels of damage to the impacting vehicle and generally less severe injuries to the occupants. WRSB are most effective for areas that have a radius greater than 50m and very little vertical sag (created by dips and hollows in the terrain). D&P Fencing Contractors are expert installers of this system and can advise you of whether your site is suited for this type of fence. Spring Steel Buffas are an economical and effective method of barrier protection for loading docks, passenger terminals, car parks, warehouses and heavy industrial applications. 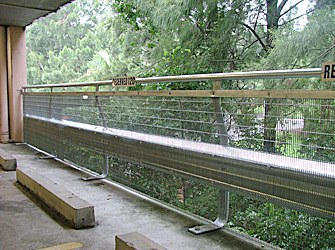 Spring Steel Buffas are available with anti-climb mesh infill and/or handrail extensions for added pedestrian safety. 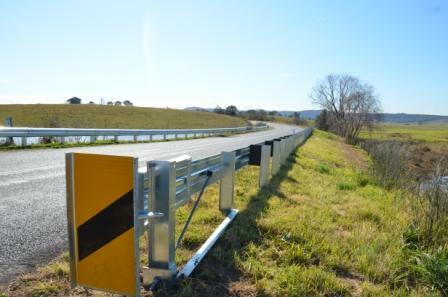 Crash cushions are designed to protect motorists from impacting the end of concrete barriers, toll plazas, bridge piers and other hazards in both temporary and permanent roadside locations. 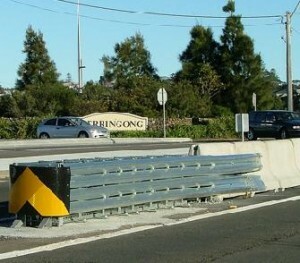 There are several types of crash cushions available, selection is based upon site requirements. Click here for further details. The ET2000 terminals are a product patented by Ingal Civil Products that are specifically designed to absorb energy from an impacting vehicle. 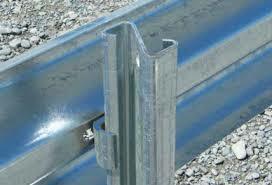 This is accomplished by deforming (flattening) the guardrail. The terminal is designed to reduce the problems associated with impacting vehicles, such as spearing, vaulting and rollover. A primary advantage of the ET2000 PLUS is its non-flared characteristic. 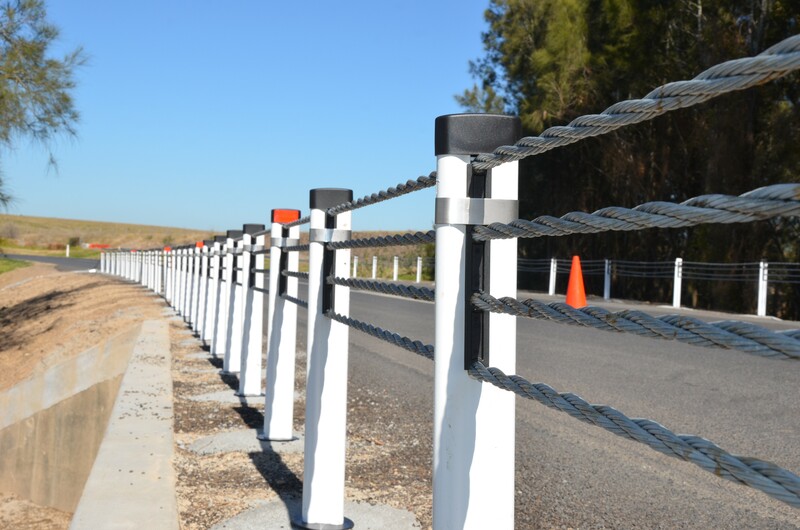 The ET2000 provides an end treatment solution for applications where there is insufficient space for a flared end terminal or when it is cost prohibitive to place embankment for a flared system. The ET2000 is available in two sizes. 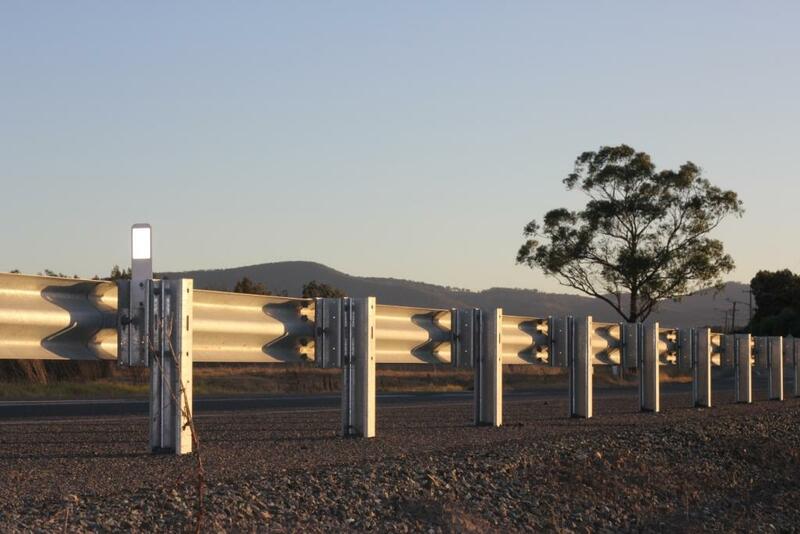 The compact 7.62m NCHRP 350 Test Level 2 terminal is an economical solution for application where the posted speed is ≤ 70km/h (however, these are presently deemed to not comply to RMS specifications). The standard 15.24m NCHRP 350 Test Level 3 terminal is acceptable for all posted speeds > 70km/h. Further technical information is available in Ingal’s ET2000 product manual. The Modified Eccentric Loader Terminal (MELT) is designed to provide a soft gating impact to prevent the end rail from spearing an impacting vehicle. 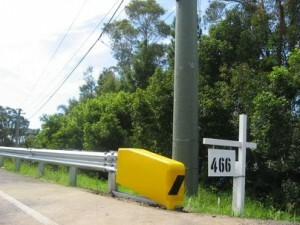 The MELT terminal is installed on a parabolic offset with rails not bolted to posts to minimise the potential for vehicle penetration. The MELT also introduces tensile and flexural strength necessary to ensure redirection performance of the length-of-need section. Further technical information is available in Ingal Civil’s Product Manual. 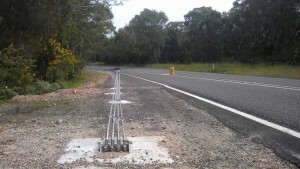 Trailing Terminals are used on ends where they are highly unlikely to be hit head on, such as divided roadways. This system is designed to provide anchorage for the barrier and acts as more of a re-directive unit when struck. They are not crash worthy terminals when struck head-on, since they are not designed to break away. The technical drawings illustrate this. 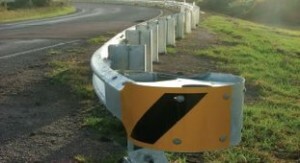 The X-Tension Guardrail End Terminal is the world’s first fully re-directive non-gating guardrail terminal end. The X-Tension Terminal has been designed and tested to meet the evaluation criteria of NCHRP 350 Test Level 3. 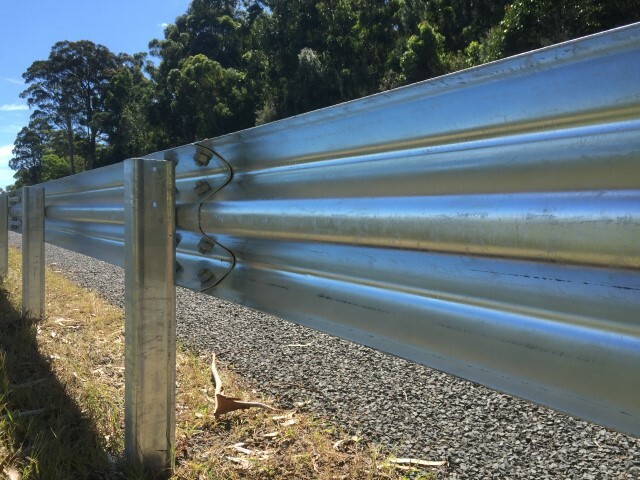 The X-Tension is perfect for W Beam guardrail end treatments, with excellent vehicle control and energy absorbing capabilities in head-on and side impacts. It can used for straight, flared & median applications. 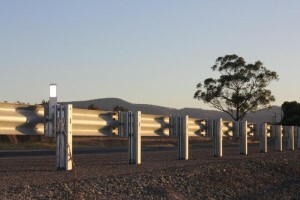 Various other systems of safety barrier fencing are available upon request.